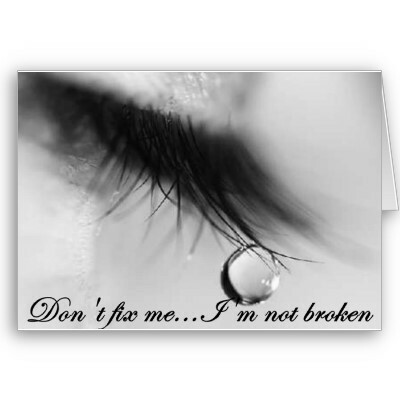 Don’t Try To Fix Me! I Am Not Broken.! with hardly any words spoken. Do not try to fix me, for I am not broken. Look not with pity, for I am not pitiful. Do not feel sorrow, for I am not sad. We all feel at some point in our lives, defeated and beaten by unexpected hardships and tragedies. What things in your life have left you feeling like you have been broken into thousands of pieces? When this happens, how do you find the strength and courage to gather up your fragmented parts of your “self” and stitch together a new version of you? Death, illness, divorce, loss of a job are all traumas that shake the foundation of who we think we are. When a loved one dies tragically in an accident, we are blindsided by the sudden loss. We do not have time to tell them we love them and to kiss them goodbye. The sudden absence of their presence in our lives leaves a hollowed, empty vastness in our heart. In time, the empty space is filled with their love that you will always carry. You cry, you mourn, you heal. An unexpected illness can leave you feeling scared and out of control of your own life and the direction you thought it was going. Your dreams and goals you had spent your whole life chasing, suddenly seem lost and unimportant. When my vision in my one eye dimmed to complete blackness as I held my two week old baby, I was terrified. I was in full panic mode at the loss of control over what was happening to my own body. I was scared that I would not be able to see my son’s beautiful eyes . I was in a place of darkness. I might miss the Sunday afternoons curled up on a sunny corner of the couch reading a paperback novel. My eyes cannot now read these fine words that lay within but I can still marvel at the beauty of the sunlight as it’s rays warm my face. Tripping over a curb and my face hitting the pavement doesn’t make me weak. It makes me more determined to make sure the next time I will see that curb. Asking others for help does not mean I am flawed, it allows acceptance of what is. Alone in my bedroom, my only companion the sound of my ticking clock, I am not lonely. I revel in the solitude that allows me to let my thoughts fly free and get lost in the complexity that is Cindy. The sound of his footsteps downstairs is a blanket of comfort calling me back to the now. I am not broken, just perfectly me. 5 Responses to Don’t Try To Fix Me! I Am Not Broken.! Reading your lines here just swept me along with their familiarity to my own being. The last two years I have been fighting to get out of this one layer of darkness taking place in my life. There have been many layers, many shades preventing my own inner light from shining through for as long as I can remember really. Time is irrelvant I’ve come to learn. Oh how I’ve come to learn that by accepting what is how it makes a shift within ourselves opening that door that we’ve inadverdently been fighting to keep closed. The fight is over…the door is open now. And its all as you say….. Thanks for sharing and posting for so many of us to relate to. Shelly, thanks so much for your comments. You are right, by accepting what is allows you to shift into a place of strength from which you can live more fully. I am so glad you have found your door. Stay strong. Blessings. This is a beautiful post and I can relate so much to every word. My diagnosis is only 2 years old but my MS is apparently a mature 30 year old! Many unexplained symptoms many years ago. I am still catching up with the news that it is now progresive and over the last 2 ears it has tried very hard to break me, and it almost did. But I started writing poetry to help me manage it and I am in a better place most days, though the lack of control still loons in front of me often. I have a four wheled walking aid and have just bought a mobility scooter, and although I know these things are giving me back a little independence, they still clash loudly in bright red colours against the image of myself as I was before. But progress has been made and I believe we handle hurdles when we are ready. I wrote a poem about this very thing last week. Thank you for sharing your thoughts. Your post has helped me to cling onto the fact that I am still me.